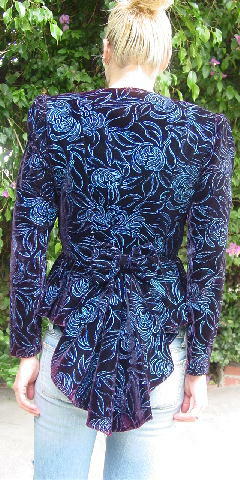 This vintage velvet evening jacket is 69% acetate, 16% rayon, and 15% nylon and was made in the USA. It has a 10 3/4" deep V neckline, shoulder pads, and long sleeves. The back has a 5 3/4" wide bow and below that is a long fantail fabric panel which extends 14" downward in the center below the bow. The front crosses over at the waist and has a two (fabric matching) button closure. 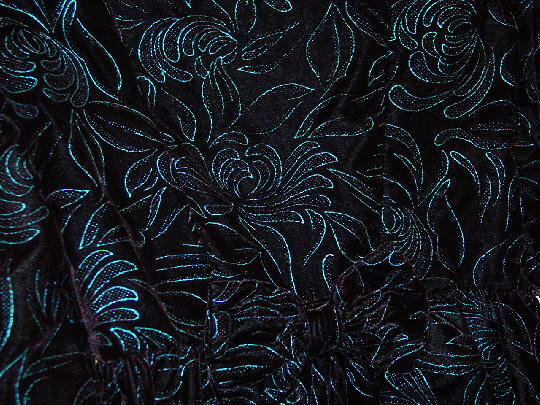 The black velvet has a tone-on-tone burgundy cast to it and is more visible in certain lights. It has a neon iridescent bright light blue design pattern. The interior dot designs have an elevated texture just like the line designs. shoulder to bottom side hem 21 1/2"